I tried to capture some of the major publications in student affairs history as well as important moments in the growth of ACPA and NASPA. Think I should add something? Let me know in the comments below. UPDATE: Great feedback from everyone on the timeline. 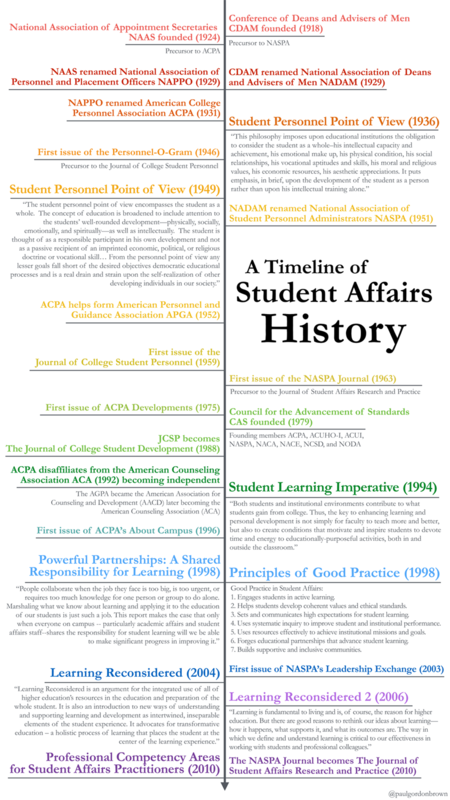 I’m thinking of creating an “Equitable Timeline of Student Affairs History” as an additional post. Given the space constraints of the design, my original focused more squarely on publication and major ACPA/NASPA events. I struggled with how to present a more inclusive history here. If there are events that should be included in an equitable timeline, put them in the comments below and I’ll work something up! Or a greeting card. Help fund my doctoral dissertation! The paid version uses a sharper, higher resolution file. For the poster, there are multiple price points, qualities, and sizes…. All proceeds help fund my dissertation. One medium-sized poster is worth half a transcribed interview. Find out more about my dissertation. 🙂 Thanks! Agreed with Michelle, the Deans of Women (disbanded as NAWE in 2000), lots of good resources out there on the importance of these women – Janice Gerda, Robert Schwartz, Jana Nidiffer, and Lynn Gangone – though it is difficult to include all of the important milestones of our history in visual – but as a history nerd, I love it! Totally agree. I did go back in and add how ACPA was founded as guests of a conference of NADW. I think that’s critical. I’m wondering how I can work with space constraints to better reflect a more diverse history. Paul – I love the ease and usability of this! I’d love to see some mention of the earlier Deans of Women conference or position. You can find some of that information at the Student Affairs History Project at BGSU: http://ul2.bgsu.edu/sahp/pages/resources2.html Great work, and yet another great visual! You’re right Michelle. I struggled with this given the design constraints. I did go back in and add ACPA’s founding as a part of NADW. I’ll keep thinking about how I can better incorporate this. Maybe we need a History of Equity and Inclusion in Student Affairs timeline? Women were so fundamental to the founding of this field.